Good morning and happy Monday! I'm excited to share with you a design that I completed over the weekend for my free monthly tutorial available to everyone on my newsletter list. 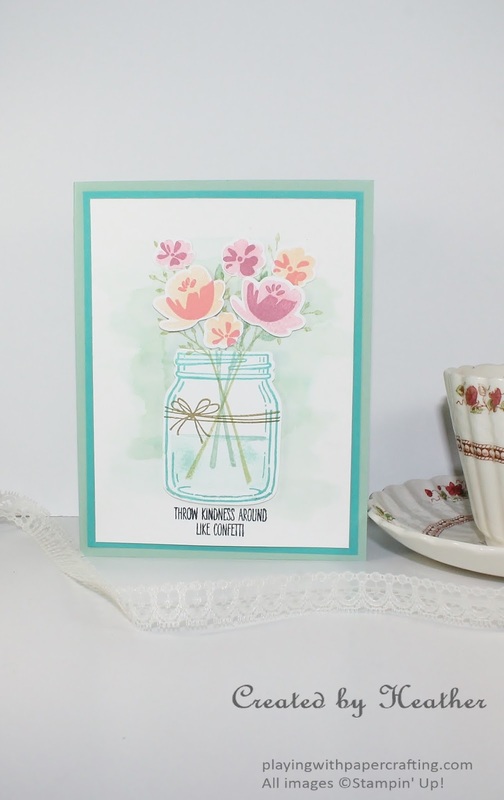 I've been itching to get at the Jar of Love Bundle and now that I've done one, I'm absolutely astounded by the possibilities with this set! 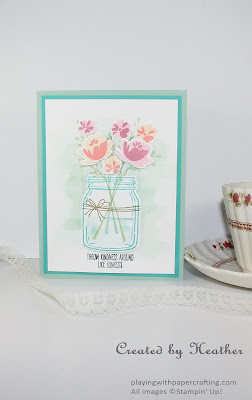 Anyway, it makes such a pretty summer bouquet and I love the sentiment that is also part of the stamp set. 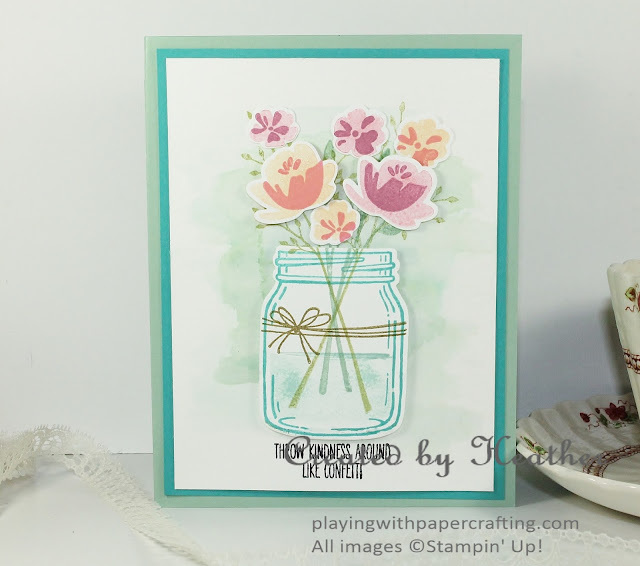 There's so many things you could put in those mason jars (which come in three sizes, by the way): you could put flowers, leaves, water, fireflies and even fish! They can have a lid or a handle or be labeled or tied with twine! I'll figure out a way to even make a Christmas candle or something! And look at all the great sentiments! This is another must-have bundle! Don't you love how the water in the jar is shaded? It looks more three dimensional that way. The flowers and leaves work so well together, and almost everything has a coordinating framelit so no fussy cutting! I will show you how to create that watercolour background if you subscribe to my newsletter before June 30th! 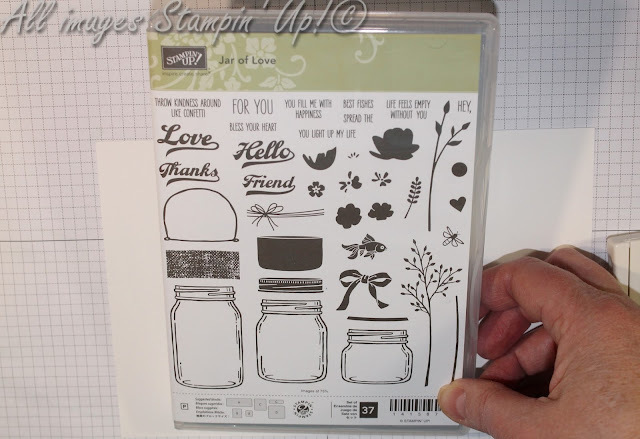 I normally only send out one or two emails a month, one being the newsletter, and any other to let you know of big happenings with Stampin' Up! so you don't miss out on any deals! You are more than welcome to unsubscribe at any time and the option is open with every email you receive. My tutorials are step-by-step photo tutorials complete with a list of supplies and measurements used. 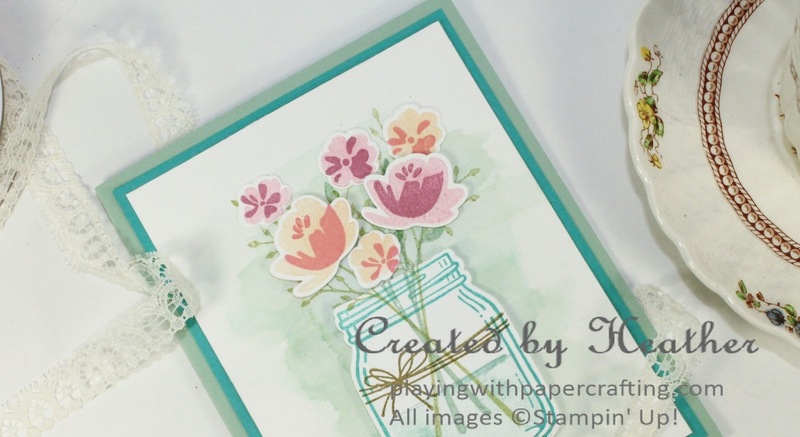 The next newsletter containing this tutorial will be out on June 30th. Don't miss this one! Last Thursday, I posted a plan to move to only 3 blog posts a week for some important reasons. If you haven't already done so, may I request that you go to this post and read my thoughts on this. My next post will be on Wednesday, June 29th. Thanks for stopping by!